The water dishes were frozen solid this morning, all except the heated one on the deck railing. 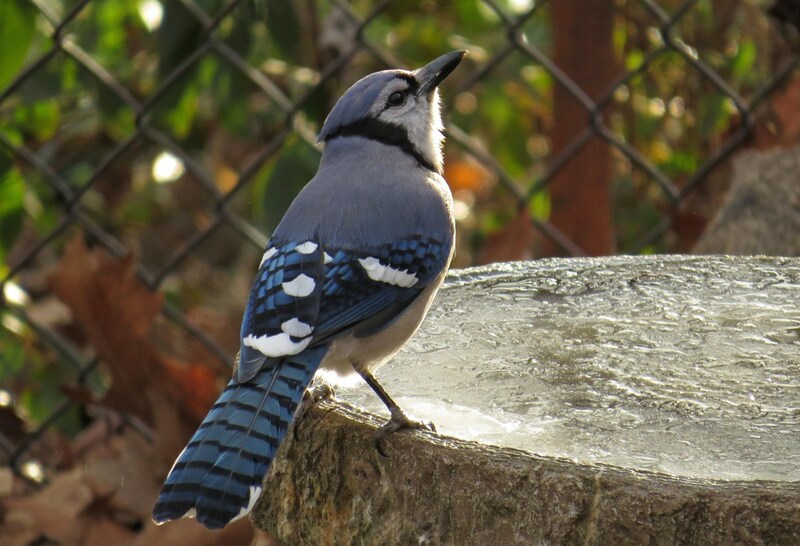 Normally, the birds would simply flock to the fountain, but alas, it is experiencing technical difficulties and is out of commission until my household hero can take a look at it. 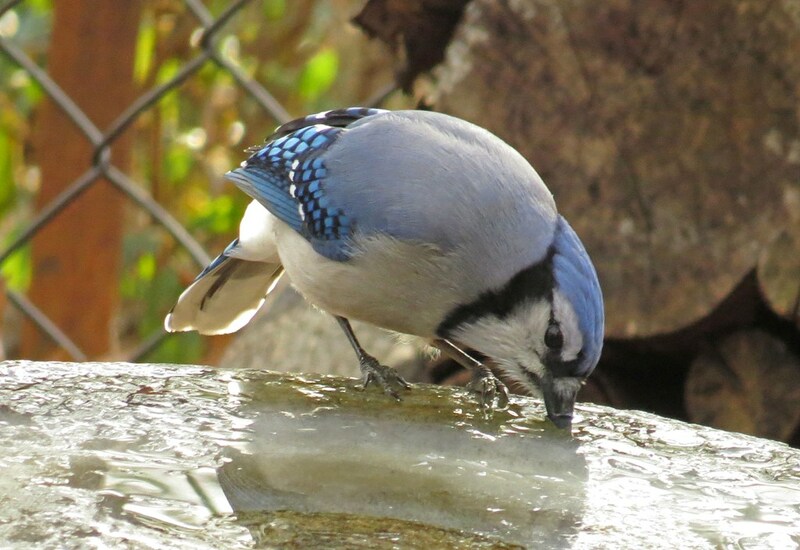 I knew the birds would be searching for fresh water, so being the kind soul that I am (I can only get away with that if you don’t really know me!) I took a pitcher full and poured it on top of the layers of ice. 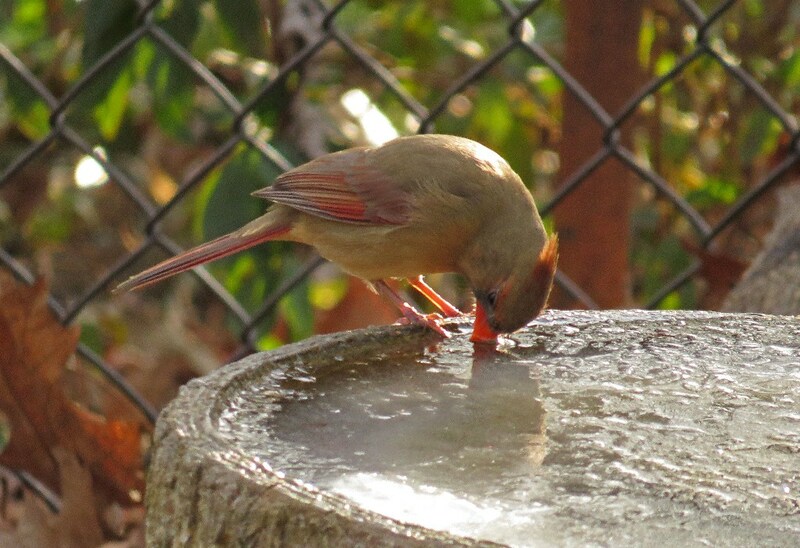 The birds seemed to know that this water would soon freeze too, because a bit of a drinking frenzy proceeded to take place. 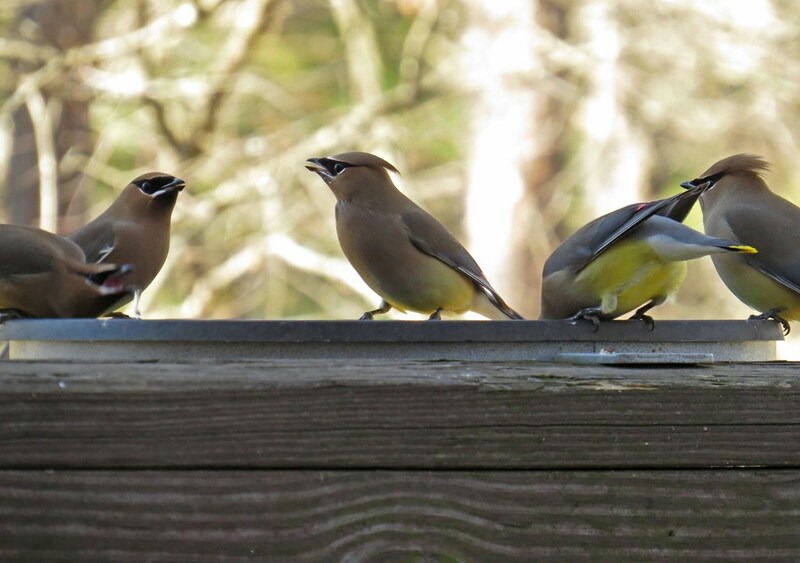 First to arrive were the Cedar Waxwings. I had a hard time getting clear pictures of them because they were a constant blur of motion and the lighting was still rather dim. 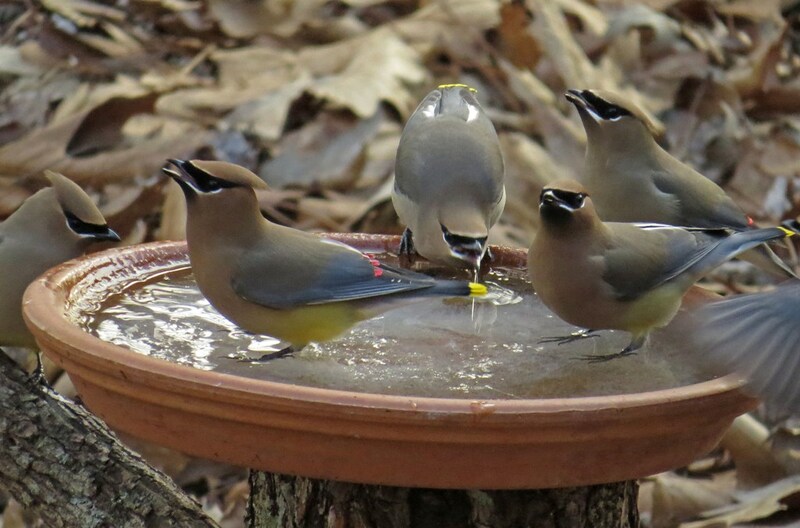 While some drank from the clay dish (I like how they are standing on the ice) another group congregated at the larger birdbath. 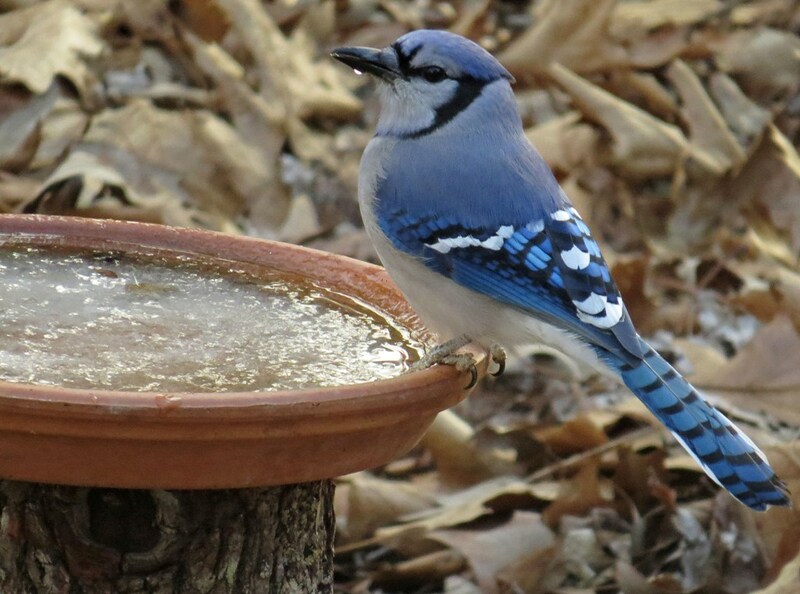 It wasn’t long before the Blue Jays showed up and took over the water dishes. You can tell that the water was freezing quickly. 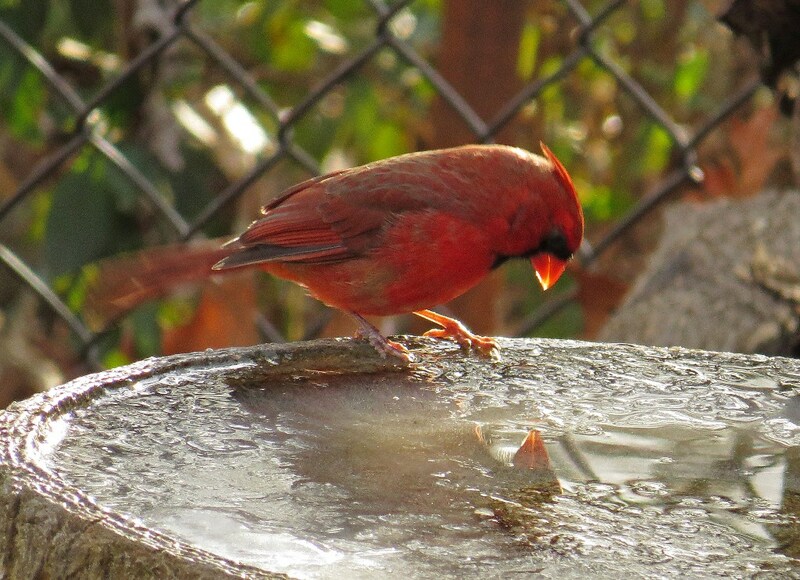 He had to poke his beak beneath the surface to get a drink. 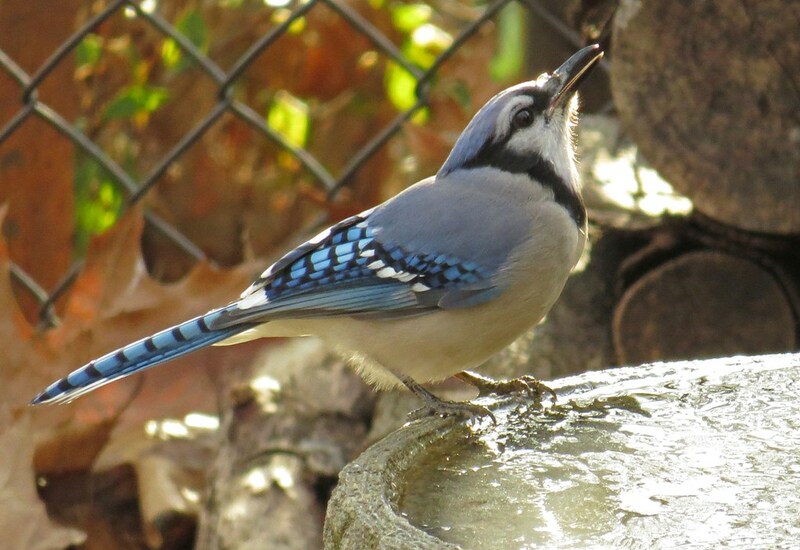 Here are a couple more Blue Jay pictures, simply because I think their markings are nothing short of miraculous. 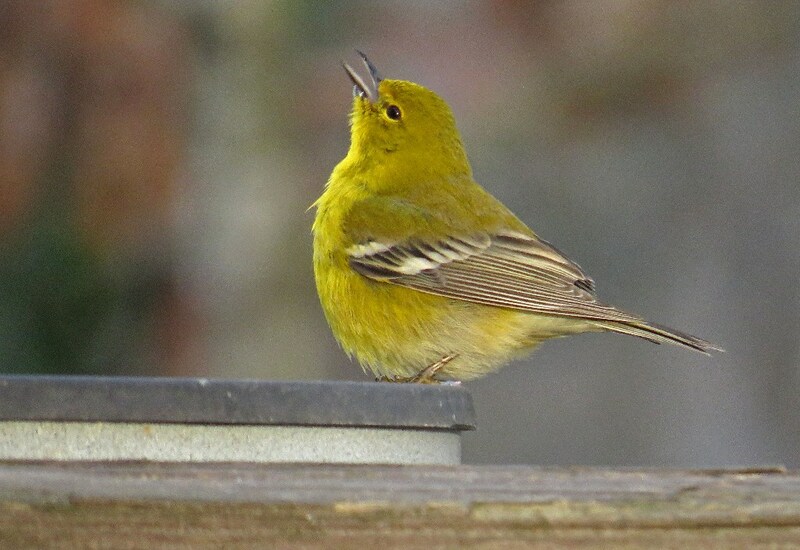 The award for the smartest bird goes to the Pine Warbler, who opted to hang out at the heated water dish to do his drinking. The temperature stayed chilly for most of the day, so I went out a number of times to break up the ice in the dishes. 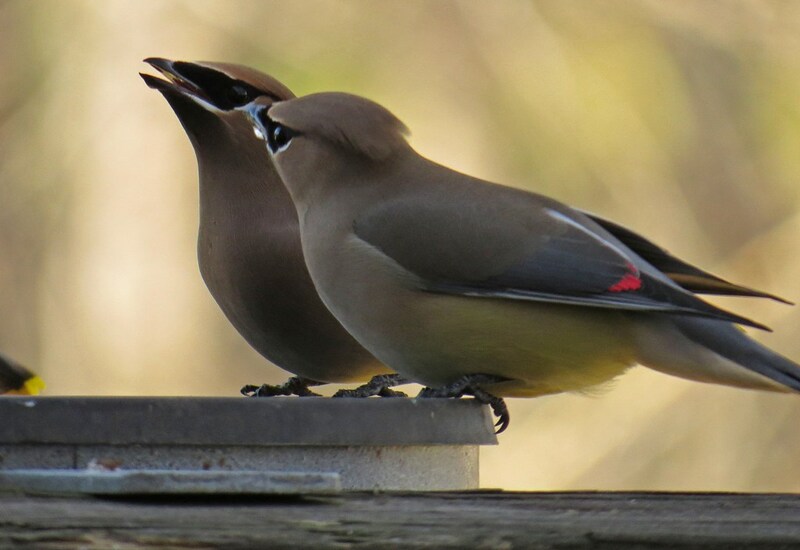 During the afternoon hours, as I was about to repeat this task, I saw a couple of Waxwings perched on the deck railing – which is not their usual hang-out spot. 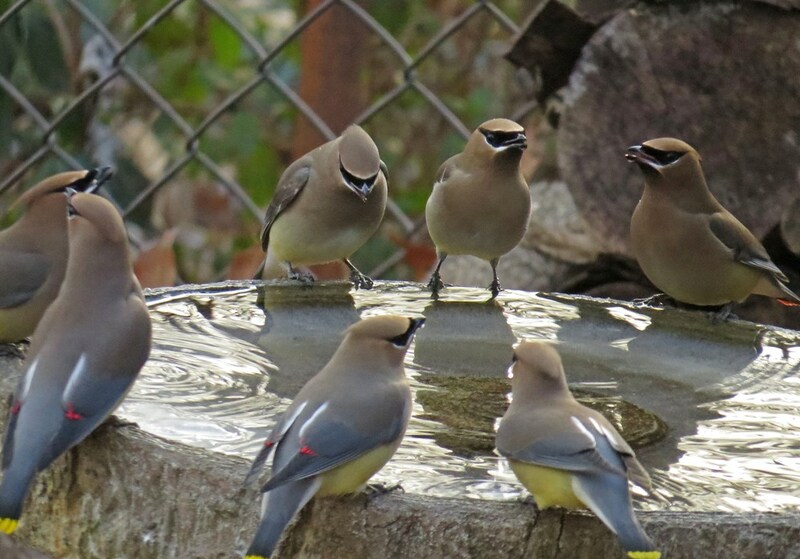 Before long, they were drinking at the heated water dish. I guess they must have heeded the wisdom of the Warbler! 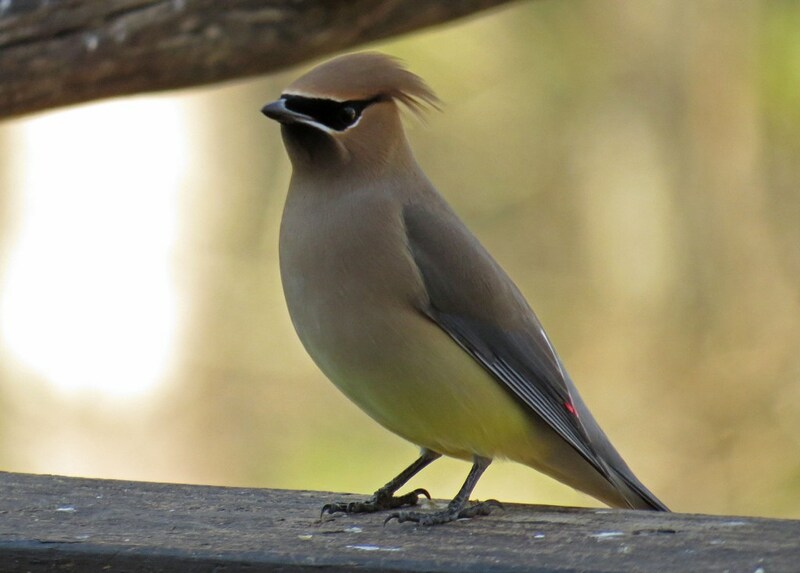 This entry was posted in Backyard Birds and tagged beauty, bird photography, birds, nature, photography, warblers, waxwings, wildlife, writing. Bookmark the permalink. Beautiful birds, lovely pictures. You had quite the crowd there. Thanks so much for sharing! Stunning and beautiful photography Kathy, love the numbers of birds and the colours, a wonderful post! It was a great start to the morning! 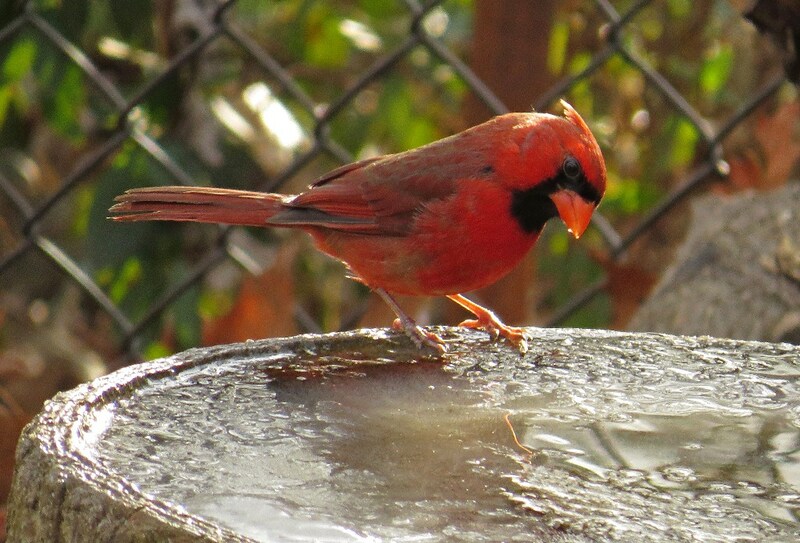 I loved watching them scurry to get their drinks before the dishes froze over again. So wonderful how you make sure the birds are taken care of! I have found no way to provide water in our continual deep freeze here in the north. While at Menards yesterday, I was perusing heated bird baths but we have no outdoor outlet. 😦 This is a problem I want to solve when we have the new landscaping finished for my bird sanctuary! Water is a must. 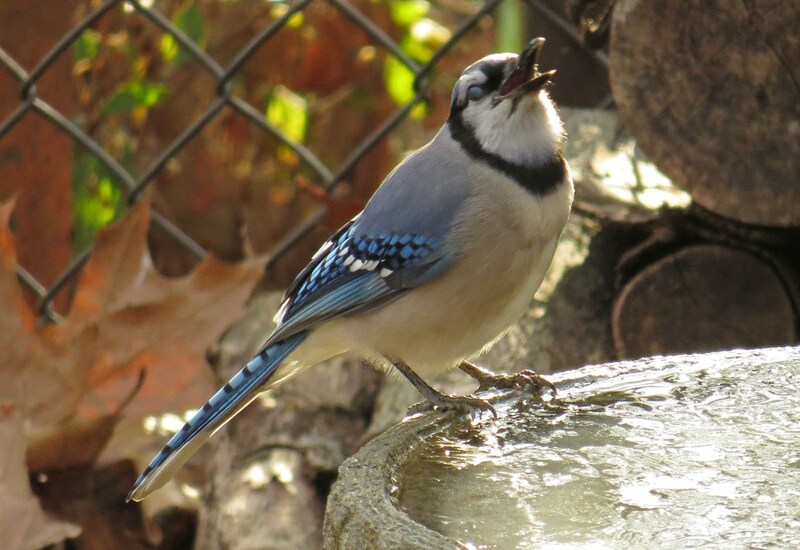 Thankfully we’ve had enough sun to provide some melt-off of the snow to give the birds some water. 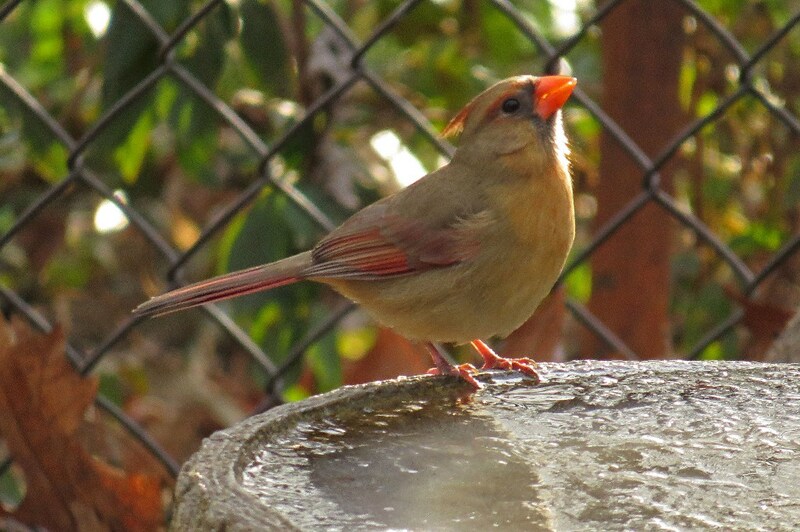 Your photos are stunning, as usual, Kathy. I just love your yard! !